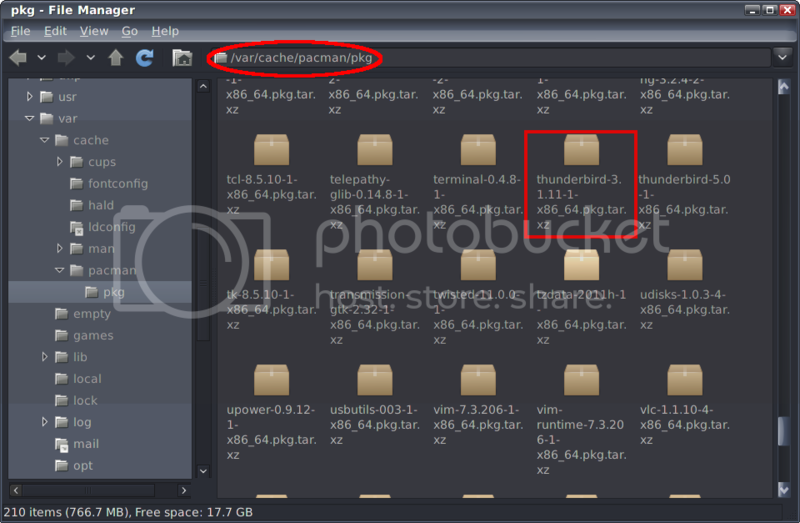 A week or so ago, I was upgrading my Slackware systems to Current and noticed an unwanted “feature” had been added to my Xfce 4.10 Thunar file manager. As you can see in the above screenie of Xfe, I have just my standard Linux file system tree in the left pane. That’s how I want it. That’s how Thunar used to be before the recent upgrades to Xfce 4.10. Coincidentally, I had this same issue in Arch Linux when they first introduced Xfce 4.10 to their repos. I had other issues there also, namely failed auto-mounting, which I also experienced in Slack with this new upgrade. X File Manager solves it all. So, if you’re tired of Nautilus, Dolphin, Konqueror (my old fav) or Thunar, give X File Manager a shot. You might find that it grows on you. X File Explorer (Xfe) is an MS-Explorer or Commander like file manager for X. It is based on the popular, but discontinued, X Win Commander, originally developed by Maxim Baranov. Xfe is developed since 2002 by Roland Baudin, a French Linux enthusiast. Xfe aims to be the file manager of choice for all light thinking Unix addicts! A recent upgrade in Arch Linux caused my Thunar file manager to lose its auto-mounting capabilities. Now granted, auto-mounting of removable media (floppy, ZIP, CD/DVD, USB, etc.) on my system is purely a convenience. It’s not a necessity. I have no fear of the command line, so mounting manually can always be achieved. It’s the principle of the thing, dammit. What used to work should continue to work. Unfortunately, as we all know, thanks to updates of one sort or another (in any operating system), this doesn’t always hold true. After doing some reading and research into the causes of Thunar’s apparent crippling, I became aggravated with Arch because recent updates have been plaguing me with breakage. Now, let’s be honest here… it’s not really Arch’s fault. Arch is a rolling-release distribution. Things change rapidly. The developers keep the base system closer to the bleeding edge that most periodic-release distributions. Anyone who uses Arch knows these things. I run Slackware as my primary operating system on all my machines (except for an old Dell Latitude 610 running Bodhi Linux). Arch is my secondary (backup) operating system on my main system. I used to use Debian for this purpose, but as much as I love Debian, it is just too sluggish about getting current versions of apps in its repos. Now don’t all you Debian folks start throwing rubber chickens at me. I understand that Debian’s legendary stability is due to the fact that its stable repos contain only tried and truly long-term tested versions of applications. That is how it should be with Debian (I run Sid as a tester on my system, by the way). In the process of trying to find out what I needed to do to fix the auto-mounting issue, I ran across some information here and there about systemd. What is systemd, you might ask. I noticed that Arch’s core repo shifted udev from its stand-alone status to a sub-app of the systemd-tools application. systemd and udev have been merged upstream. We will still ship them in separate packages. However, in order to keep things simple, udev will now be part of a package called systemd-tools. 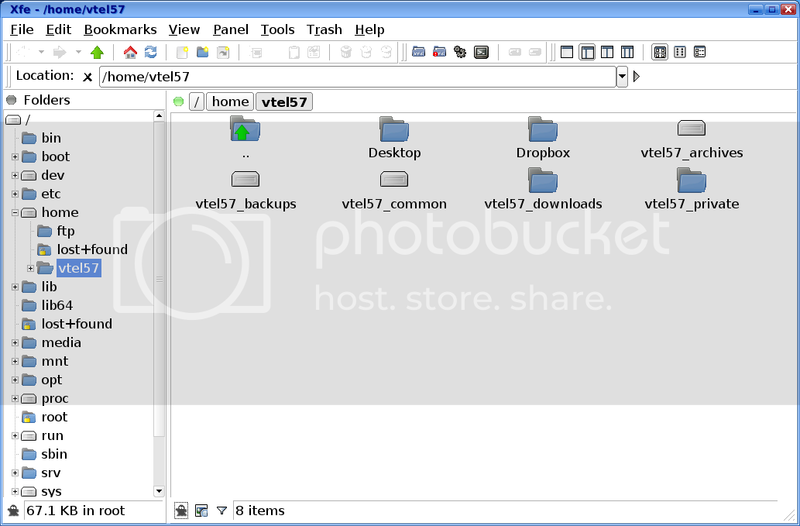 This package contains several other standalone tools which can be used without systemd. The astute reader will note that this also means the entirety of systemd is available in the core repository. Please replace udev with systemd-tools when prompted. If you upgrade the linux package at the same time, you may see an error during initramfs creation that the udev hook is not found. After the upgrade completes, please rerun ‘mkinitcpio -p linux’ to ensure that a bootable image is created for the newly installed kernel. Seeing this made me wonder if Arch was going to transition to systemd over initscripts sometime soon. To be honest, as some of the folks at Scot’s Newsletter Forums/Bruno’s All Things Linux can attest to, I actually became a bit peeved… pissed off, you might even say. 😉 All’s well, though. Ignorance is a great stimulant for fear and loathing. Knowledge paves the way for understanding and acceptance. A little research was in order, so I spent the next few days after this initial rant about systemd learning what I could about it. Eventually, I decided to convert my Arch to systemd 100%, eschewing initscripts entirely. How did that go? Relatively well, actually. Read more about how I did it and how things turned out HERE, if you’re interested. I even managed to solve my auto-mount issues along the way. systemd is available in many distributions already. I do believe that it has a good chance of replacing the standard initscripts method of services in GNU/Linux in the near future. If you’re a tinkerer, go give it a try on some test partition on one of your systems. I wouldn’t recommend converting 100% to systemd on your main operating system, though; not unless you really know what you’re doing. It wouldn’t hurt to learn the fundamentals of systemd. I believe it’ll be around for a while. Back in 2006, I was a fresh-faced new GNU/Linux adventurer. Relatively quickly I settled on Slackware as my primary operating system. My GNU/Linux mentor, Bruno Knaapen, once predicted that I would end up with Slackware because I definitely had the Slacker attitude. Miss you, Bruno, old friend. He called that one right. I run Slackware as my primary and Arch Linux as my secondary (backup) OS on my main system. I also run Slack on my laptop and my shop systems. Back in the beginning of my GNU/Linux adventures, I ran Slack as primary and Debian as secondary. Arch beat Debian out for that position quite a while back, though. Don’t take this the wrong way. I still have a deep and undying love for Debian. I believe it is one of the finest distributions of GNU/Linux ever. About the only complaint one can have with Debian is that its software is a bit dated. No, Debian is not a risk taker’s distro. It’s staid and stable as a ROCK. Part of this is because of all that older and well-tested software in its huge repository. If you want a distribution that is just going to work… and work… and work without a glitch or burp, Debian is for you. Earlier today, we were discussing Debian at Scot’s Newsletter Forums – Bruno’s All Things Linux. I realized that I had not had a copy of Deb on any of my machines for a year or so. That’s not like me. I always keep an up-to-date Deb somewhere on my systems… just in case. I decided to download and install it. I have numerous “tester” slots open on my main machine, so space is not an issue. The install went off without a hitch. I had to make some minor edits to Arch’s menu.lst (the MBR controlling boot-loader on my system) and to Debian’s fstab (switch from UUIDs to /dev/… nomenclature). My only issue now is that I need to install the proprietary Nvidia drivers. I usually do this manually, but this time around, I think I’ll do it the “Debian Way“. Knowing Debian, this shouldn’t even cause me to break a sweat. If you have moderate GNU/Linux experience, and have never tried Debian before, I strongly recommend that you give it a looksee. Next to Slackware, Debian is the oldest still maintained GNU/Linux distribution. Slack only has it beat by a few months, actually. Try Debian. You’ll learn a lot about GNU/Linux with this distribution. You’ll also get the unique experience of using one of the absolute best package managers in existence… apt. MATE is a Gnome 2 fork started by Arch Linux Forum member Perberos. I like the description: MATE Desktop Environment, a non-intuitive and unattractive desktop… Heh! Can’t get much more honest than that. To be perfectly upfront with my readers here, I have never tried Gnome 3 or Unity on any of my systems. I do have some experience with KDE 4, as many of you know; none of it was pleasant. My main desktop environment is Xfce. I’ve been using Xfce primarily in my main (Slackware) and secondary (Arch) installations for quite some time now; ever since KDE 4 first came on the scene, actually. I was a big KDE fan up till then. Oh well… the world moves on. GNOME 2 may not have been ideal for touchscreens or tablets, and it wasn’t the most visually dazzling interface out there. But it got the job done without giving me a headache or turning every mouse click into a surprise by eliciting totally unpredictable behavior. Seriously, folks… as I always say, whatever works best for you is what’s best for you. If you would like to go back to the older, more stable, less visually orgasmic Gnome 2 days, give Mate a shot. Let’s do things the “Arch Way” for a bit, OK? 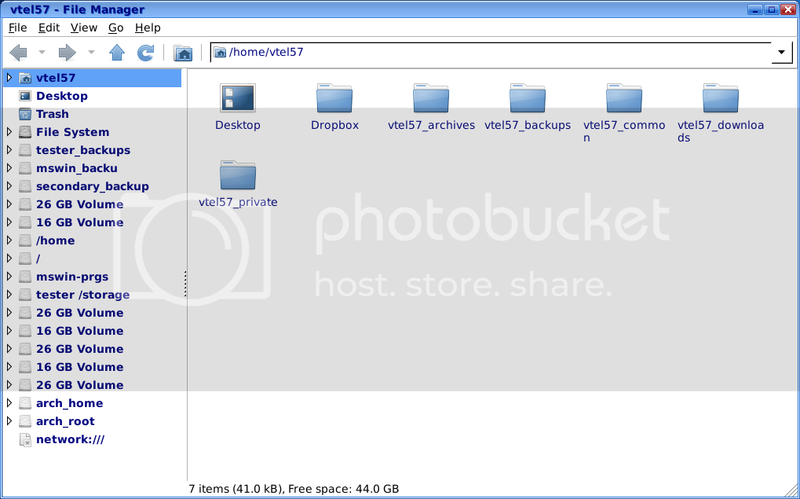 As you can probably tell from this recent article, I do maintain a good sized distro farm. Sometimes, I’ll plow up one field and plant a new distro. Other times, I leave a field planted with a certain distro for long periods of time. This is the case with Arch Linux. It’s one Linux distro crop that I probably will continue to plant regularly. You will always find two distributions on any system I have up and running for my own use; Slackware, my primary operating system and Debian, my backup operating system. Both are what you might call stable to the point of ennui. That’s why they are my operating systems of choice. I’m an old geek. Old geeks don’t like surprises. We like everything steady and familiar. If someone were to ask me, “Hey Eric, what would you do if you couldn’t run Slackware or Debian?” I’d have to admit that Arch Linux would probably be my next choice as a primary operating system. I’ve always considered Arch to be like a secret love child of Slackware, even though they have no direct relation in the Linux Tree. I think of Arch in this light because it shares two goals with Slackware; namely, beautiful simplicity and a lightness of being. It’s almost Zen-like, huh? Ahhhhmm! Ahhhhhmm! Oops! 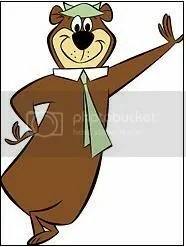 Wrong kind of yogi. I meant… er, never mind. So, about Arch Linux… Oh, did I mention that Arch has an exceptional support community, excellent documentation, and a fabulous wiki? Well, it does. Visit the Arch Linux main page. Do a little reading, follow some links. There is a wealth of information at that site. The Arch Wiki has been helpful to me many times in resolving issues that were not even specific to Arch. There is a lot of compiled Linux knowledge there. When you’re visiting the wiki, be sure to check out the Beginner’s Guide… absolutely outstanding! And lastly, if you would like to give Arch a looksee, I highly recommend securitybreach’s excellent installation tutorial available for you at Scot’s Newsletter Forums – Bruno’s All Things Linux – Bruno’s Classroom –> Installing and setting up Archlinux. This article was originally published on my Nocturnal Slacker | Lockergnome blog. To read the it there and see the accompanying comments, click HERE. 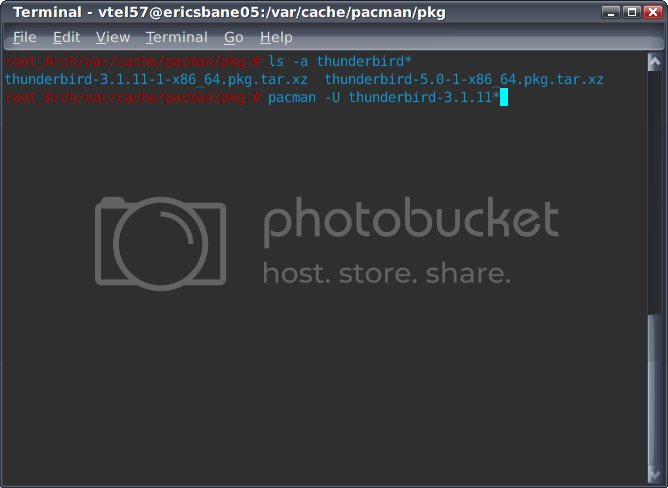 For a couple weeks now, I’ve been having issues with Thunderbird 5 in my Arch Linux installation. I have a few much-used extensions installed in my Thunderbird, and 5.x broke four of them when it updated in Arch from 3.1.11. I tried a few work-arounds. I tried to live without the extensions. This morning I decided that I just wasn’t going to deal with this any longer. I reverted. How’d I do that, you might be asking? Well, with Arch (in most instances), it’s pretty simple. First item of importance is that I had a backup of my Thunderbird 3.1.11 .thunderbird directory backed up on separate media (DVD). Second item is that I had not run pacman -Scc in a while. This command clears the cache of installed items in Arch. So, with those items being satisfied, I was able to revert using the magical pacman -U command. The asterisk denotes auto-completion at the command line. BASH will automatically add the remaining characters to the command. And with that simple series of commands, my world is back to being wonderful once again. Oh, and to make sure that I don’t accidentally upgrade T-bird on my next pacman update session, I’ve added it to the ignore list in my pacman.conf file. There you have it. The wonderful simplicity of Arch package management. …you can’t have just one. With that thought in mind, here’s a freshly minted GNU/Linux distribution for you diehard experimenters to check out. LDR is another wonderful choice (ain’t GNU/Linux great!?) in your further Linux adventures. It was recently transformed from idea to actual distribution by friend Thomas Medhurst. It’s based on Arch Linux and uses the Gnome Desktop Environment. Keep in mind, this one is fresh off the assembly line. It might need some polishing and tweaking here and there. Get in on the ground floor on another new GNU/Linux, folks. Thomas is also very interested in hearing any and all feedback and suggestions. You can contact him at the LDR webpage or his own personal webpage. Give it a go… might be fun!